Lady Gaga has always been extra. That word doesn’t seem large enough for what Gaga has always brought to her performances and to her overall aesthetic. She does everything BIG. She FEELS. She LIVES when she’s on stage. She’s Celine like that. Yes, Celine Dion is now a verb for feeling all the feels when you’re performing. It shouldn’t have been a surprise that Gaga turned her Grammy performance of “Shallow” into a glam-rock spectacle complete with an extreme energy that didn’t match the song at all. Like, at all. But you know what? I’m not mad at it. THIS is the kind of theatrics from Lady Gaga that I can get into. When she’s writhing around on her mic stand and scream-singing at a terrified-looking Mark Ronson, that’s the Gaga I know and love from The Fame Monster days. She’s never been subtle. I don’t want subtle Gaga. I’m still trying to forget the denim-shorts and sequin-less Joanne phase (she also took home a Grammy last night for that album). So, Gaga and her extra on stage can stay. It’s the Gaga who brings those theatrics to her acceptance speeches that I can’t get down with. You know I feel HARD. I cry all the time. I’m not knocking Gaga for crying. I understand Gaga’s excitement over A Star Is Born. I can even understand her acting Taylor-Swift shocked over any awards for acting she receives. 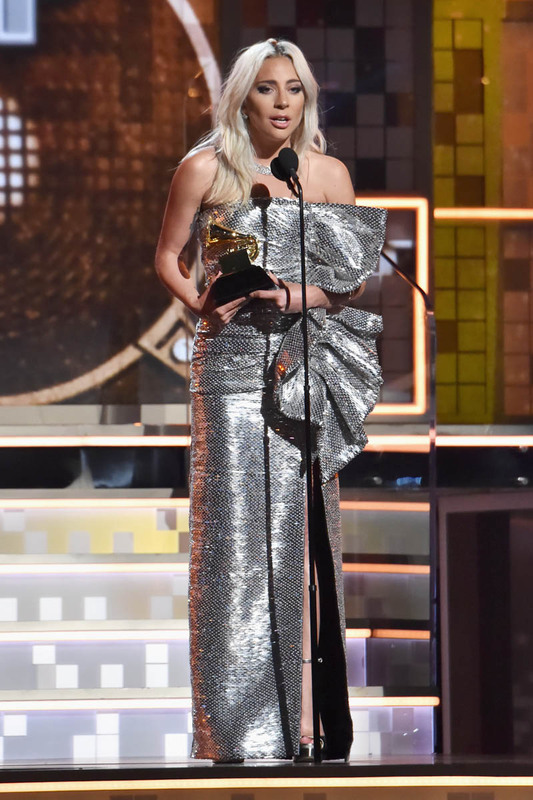 “Shallow” won the Grammy for Best Pop Duo or Group. At this point in awards season, it has won every major award it has been up for. Before last night, Gaga had won SIX Grammys. She’s now up to nine. I don’t understand the shock and awe. The bowled over sobs feel false this late into awards season. GIRL, we all knew you were going to win. Don’t act like you thought The Backstreet Boys were going to run away with this one. No disrespect. This is also a side of Lady Gaga we’re used to seeing. She’s used her platform to shed light on hard topics. She’s spoken candidly about her own struggles. This candor and sincerity to speak on something that might help her “little monsters” or anyone else who is going through their own sh-t is something we’ve come to expect from her. She is able to speak on these topics from experience, in a way that feels genuine. I want more of this authentically emotional Gaga than the one that’s still surprised “Shallow” is sweeping at every show. Which Gaga will we get at the Oscars?